This World Cup has proven you can’t keep a good thing down. Belgium and Russia played their way through 90 excruciating minutes earlier and this wasn’t set up to be much better. Algeria looked to frustrate Belgium in their group opener and South Korea looked cowardly in possession against Russia, so a match-up between the two wasn’t wildly appetising. Wrong again. 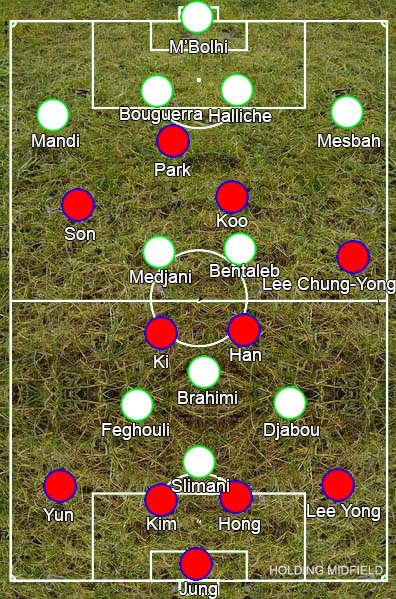 The match was of little interest tactically – both teams lined up in 4-2-3-1s, Algeria pressing and Souuth Korea sitting back – but it was a good entertaining game. Algeria were clearly the superior side, evading South Korean attempts to track them and putting together some passing moves as good as anything seen at the tournament. It wasn’t much of a surprise when they raced to a deserved early lead. Hong Myung-Bo’s reply was to bring on 6ft 4 striker Kim Shin-Wook. South Korea then just hit long balls up towards him and contested the knockdowns, grabbing two late goals to scare Algeria in an otherwise convincing performance. The result puts Algeria in a great position to get out the group, which is especially good for viewers when you consider how poor the other two teams are.